Lately I’ve been listening to the free meditation CD I received just because I renewed my annual magazine subscription for Best Health Magazine. Often, I borrow CDs at the Calgary Public Library or rely on YouTube for meditation music, as part of yoga regimen or plain mind relaxation. Either way, I spend nothing. But owning the free meditation CD has some advantages: I don’t have to open my laptop nor be bothered with overdue fines. All I have to do is to choose a comfy spot and a quiet room, then immerse myself to the sound. All songs are relaxing. You can hear the sound of nature coupled with instrumental backgrounds. With the music playing in the background and all-intent focus, I’m on my way to a relaxing, meditative retreat. 10, 15 minutes. The duration of meditation varies. It doesn’t matter. The immense challenge is sticking and having daily dedication for meditation. 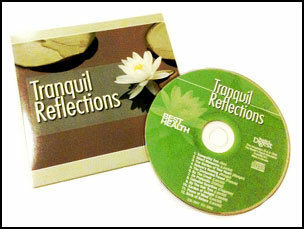 Sorry “Tranquil Reflections” doesn’t come with action-inducing audiobook or instruction to urge you start reflecting. You must have the willingness. The goal in mind. I’m not exactly sure if you are going to get one if you subscribe to the Best Health Magazine at this moment nor in any time of the year. This freebie might end anytime soon. But might as well find out. If the CD is not available then how about consider subscribing to the magazine anyway. You can read another post: why I like reading Best Health Magazine, if you are curious why I subscribed a year ago and renewed last month. You can find it invaluable in achieving the goal of a healthy lifestyle. Let the music clear your mind, relax your body, and nourish your soul. Do you have any favuorite music you listen to while meditating?